Studying the ecosystem carbon cycle requires analysis of interrelationships between soil respiration (Rs) and the environment to evaluate the balance. Various methods and instruments have been used to measure Rs. The closed chamber method, which is currently widely used to determine Rs, creates a closed space on the soil surface, measures CO2 concentration in the inner space, and calculates Rs from the increase. Accordingly, the method is divided into automatic or manual chamber methods (ACM and MCM, respectively). However, errors of these methods and differences in instruments are unclear. Therefore, we evaluated the characteristics and difference of Rs values calculated using both methods with actual data. Both methods determined seasonal variation patterns of Rs, reflecting overall changes in soil temperature (Ts). ACM clearly showed detailed changes in Rs, but MCM did not, because such small changes are unknown as Rs values are collected monthly. Additionally, Rs measured using MCM was higher than that using ACM and differed depending on measured plots, but showed similar tendencies with all measurement times and plots. Contrastingly, MCM Rs values in August for plot 4 were very high compared with ACM Rs values because of soil disturbances that easily occur during MCM measurements. Comparing Rs values calculated using monthly means with those calculated using MCM, the ACM calculated values for monthly averages were higher or lower than those of similar measurement times using the MCM. The difference between the ACM and MCM was attributed to greater or lesser differences. These Rs values estimated the carbon released into the atmosphere during measurement periods to be approximately 57% higher with MCM than with ACM, at 5.1 and 7.9 C ton ha−1, respectively. 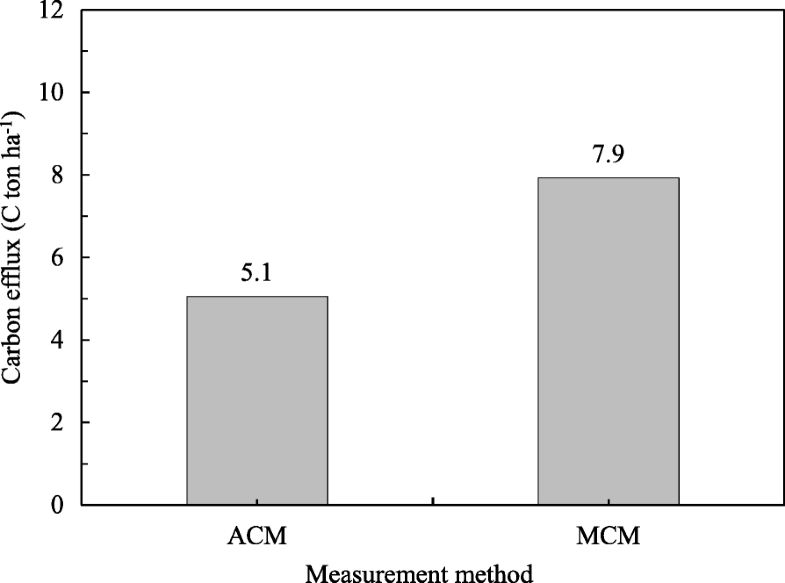 ACM calculated average values based on various Rs values as high and low for measurement periods, but the MCM produced only specific values for measurement times as representative values. Therefore, MCM may exhibit large errors in selection differences during Rs measurements. Therefore, to reduce this error using MCM, the time and frequency of measurement should be set to obtain Rs under various environmental conditions. Contrastingly, the MCM measurement is obtained during CO2 evaluation in the soil owing to soil disturbance caused by measuring equipment, so close attention should be paid to measurements. This is because the measurement process is disturbed by high CO2 soil concentration, and even small soil disturbances could release high levels into the chamber, causing large Rs errors. Therefore, the MCM should be adequately mastered before using the device to measure Rs. In terrestrial ecosystems, soils contain more carbon than that in the atmosphere and vegetation. These soil carbon movements are directly linked to the atmospheric CO2 concentration and affect the global carbon cycle (Oikawa 1991; Lee et al. 2017). Therefore, understanding the movement of soil carbon in response to climate change is very important. Carbon emissions from the soil to the atmosphere consist primarily of respiratory processes for obtaining energy in microorganisms and the underground biomass of autotrophic plants (Fang et al. 1998; Hanson et al. 2000). The soil respiration (Rs) measured in the ecosystem is the sum of these two factors, which determines the amount of CO2 released into the atmosphere. In addition, since the Rs is very highly correlated to environmental factors such as soil temperature (Ts) (Wu et al. 2006; Wang et al. 2006; Eom et al. 2018; Jeong et al. 2017a; Jeong et al. 2017b), soil moisture content (SMC), and organic matter content, many studies have measured such environmental factors to analyze their relationship (Aerts 1997; Lee et al. 2008; Lee et al. 2010; Jeong et al. 2017a, b; Eom et al. 2018). Currently, various Rs measuring methods have been developed, but the most widely used is the closed chamber method. This method measures the rate of increase of CO2 concentration inside a closed chamber space fixed on the soil surface (Jeong et al. 2017a, b; Lee 2018). In addition, the closed chamber method has been applied to various measuring instruments according to the purpose of the research, such as automatic chamber method (ACM), which can obtain continuous soil respiration data (Suh et al. 2006), and the manual chamber method (MCM). ACM is a system in which several chambers are opened and closed automatically, allowing the sequential and continuous acquisition of Rs values (Liang et al. 2004; Suh et al. 2006; Eom et al. 2018). Using this system, Rs data reflecting the influence of various environmental factors on the ecosystem can be collected, so that the short-term or long-term Rs characteristics can be elucidated. However, since these measurement devices require the construction and operation of a complex control system, the installation cost is high and skills are required to operate the system, which increases the burden on researchers who have to concentrate on the analysis (Suh et al. 2006). In contrast, the MCM uses a relatively simple measuring instrument that complements the cap on the collar installed in the soil to create a closed space from where it calculates the rate of CO2 concentration increase to calculate Rs values (Lee, 2018). Therefore, Rs data can be collected using ACM at a relatively low cost and effort. Both methods have been selectively according to the purpose of the research, but there is not enough information on their difference and associated errors. A clear understanding of the errors due to differences in instruments and methods is essential for the interpretation of accurate results. In this study, the Rs was measured using both methods and the results were analyzed. These studies are expected to contribute to the interpretation of research results obtained using different measuring instruments in different forests. The study site was located in a natural temperate deciduous forest on the west-central part of the Korean Peninsula (340 m above mean sea level). This area is in the temperate monsoon climate region. The dominant tree species in this forest is Quercus serrata along with other species such as Carpinus laxiflora, Capinus cordata, and Fraxinus rhynchophylla (Lee et al. 1992; Lim et al. 2003). According to the theory of climate climax, the sere of forests obtains the climax forest, such as C. laxiflora and C. cordata through Quercus. The average annual precipitation and temperature are 1365 mm and 11.3 °C, respectively and the temperature is approximately 0.5 °C lower than that of Seoul, which is 30 km to the south. However, the lowest temperature in January is − 5.0 °C, which is 1.6 °C lower than that of Seoul. In winter, it is cold and dry, but in summer, it exhibits a hot, humid, monsoon climate, with frequent precipitation due to the wet monsoon climate (Lim et al. 2003; Yun et al. 2012). Firstly, in the ACM, Rs was measured using an automatic open/closed chamber (AOCC) system with six chambers installed in the measurement area and it was continuously determined from May to October 2015. The chambers have a long octagonal shape (20 × 30 × 8 cm, L × W × H) to avoid any circulation stagnation zones and were manually made of stainless steel materials. The dimensions of the chamber were considered so that setting the collar did not capture small plants on the measuring point to avoid an underestimating of respiration rate caused by photosynthesis of plants in the chamber (Suh et al. 2006). Each chamber closed for 10 min automatically, and the air in the closed circulation system from chamber to infrared gas analyzer (IRGA; LI-820, Li-Cor, Lincoln, NE, USA) was circulated through the IRGA by a pump to measure the CO2 (Eom et al. 2018). The CO2 concentration was stored in the data logger from the IRGA at 2 min interval. where a is the increasing rate of the CO2 (ppm min−1) in the closed chamber system, ρ is the density of CO2, L is the total volume of the closed chamber system (m3) included in chamber, tube, IRGA, pump etc., and A is the surface area in the chamber. where a is the increasing rate of the CO2 (ppm min−1), ρ is the CO2 density (mg m− 3), V is the volume of the chamber (m3) included in collar and chamber cap, and S is the measurement area (m2). In here, the volume of the collar depends on soil condition such as the litter, the measurement point and season, slope degree, etc. Therefore, we collected these data when Rs was measured. Also, in both methods, the increasing rate of CO2 is the most important parameter for calculating the Rs. The Rs was calculated using parameters such as CO2 density, soil surface area, closed chamber volume. Before measuring the Rs, IRGAs of two methods were calibrated using standard gas (915 and 1543 ppm) to minimize the bias of the instrument. For the study period, Ts was measured at a 5 cm depth using the thermocouple (T-CC, 0.32 mm, Ninomiya) in the chamber. In addition, the soil moisture content (SMC) was also determined near the chamber at a 0–10 cm depth using a CS616 instrument (Campbell Scientific Inc., Logan, UT, USA). The precipitation was recorded using a rain gauge (HOBO micro station, Onset, MA, USA) in the upper part of the forest canopy. The Ts showed clear seasonal variation such as increasing from May to the Summer month of August and decreasing from Summer to Autumn. 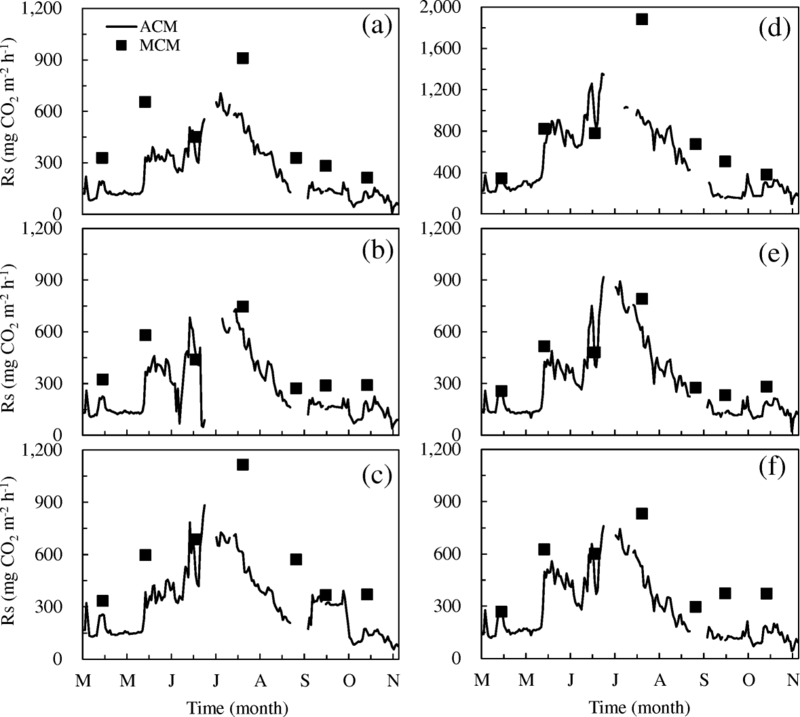 These seasonal changes in temperature are common in temperate regions (Suh et al. 2006; Eom et al. 2018). 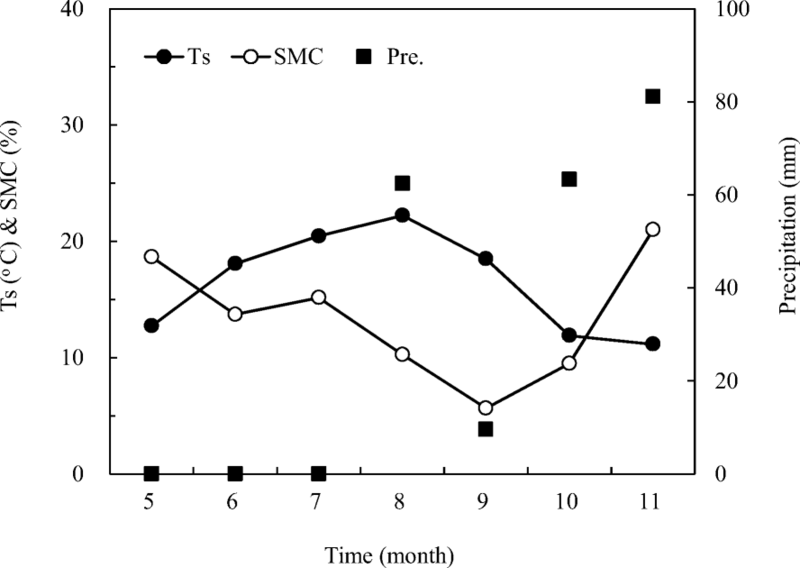 The average Ts was 16.4 °C calculated from the monthly mean value during the study period. The minimum Ts was 11.2 °C in October, and the maximum was 22.2 °C in August (Fig. 1). The difference in the Ts between May and August was 11.0 °C. The total precipitation during the measurement period was an average of 216.4 mm. In 2015, the annual precipitation was 823.4 mm (Eom et al. 2018). Precipitation in the study area differs yearly, but the average precipitation during the study period was very small compared to the average of approximately 1300 mm. The monthly distribution of precipitation was not measured from May to July and high rainfall was observed from August to November. The precipitation during the study period was 216.4 mm, which fell from August to November, consisting of 62.4 and 63.3 mm in August and October, respectively, and the highest precipitation was 81.1 mm in November. In the Monsoon Asia region, the temperature along with precipitation increase from the Spring, with the highest levels occurring in August, followed by a gradual lowering of both to the Winter (Jung et al. 2013; Laiju et al. 2012). However, no typical pattern of change was observed during the measurement period in this study. Since both methods were compared under the various environmental conditions, the accuracy and usability of the results are expected to be high. On the other hand, the SMC change relative to the precipitation and plant season. In the leaf expending season, the SMC was relatively high but it gradually decreased from 18.7% in May to 5.7% in September. Although the soil was very dry, the supplied water soon disappeared and did not contribute to restoring the soil moisture to a high state (Fig. 1). The Rs values determined using both methods showed a pattern of seasonal variation similar to that of the overall temperature change. This seasonal variation in Rs is a common feature in the Monsoon region ecosystems. However, there is no definite seasonal change as the temperature changes. This is because Rs is affected by factors other than geothermal influences (Eom et al. 2018). The Rs values measured using the two methods were very different depending on the measurement point and time. For example, for plot 2 and 5, both values were similar overall. However, in plot 1 and 3, MCM values were somewhat higher than those of the ACM, and in Plot 4, both trends were evident. In contrast, in plot 4, the ACM and MCM values were comparable, but in July, the ACM value was 933.7 mg CO2 m−2 h−1 compared to 1882.1 mg CO2 m−2 h−1 with the MCM, which was approximately 50% lower. We investigated if these values were affected by certain factors, and the result showed that data collection using the MCM required careful handling. Rs is a measure of the diffusion of CO2 gas accumulated at high concentrations in the soil into the atmosphere, which has low levels (Rochette et al. 1991; Healy et al. 1996). Compared with soil CO2, CO2 in the atmosphere rapidly diffuses, so there are not many cases in which the high concentration is maintained, but the soil CO2 concentration remains high. To measure the Rs, the chamber cap was attached to the top of the collar fixed on the soil. Then, the high concentration of CO2 gas in the soil was released into the chamber by the movement, accounting for the high Rs. This conclusion is based on the fact that the initial CO2 level in the plot was very high, at 1232.1 ppm, and the fixation of the collar in the soil was low. In the Rs measurement using the MCM, this error may have various causes, but it seemed that the study area had weakened physical soil properties owing to continuous drying from when the measurements commenced (Fig. 2a–f). The ACM values of plot 4 were similar to those of plot 2 and 5, except for July when the problem was solved (Fig. 2b, e). Therefore, in measuring Rs using MCM, extreme caution should be exercised to avoid shaking the collar during measurements. In contrast, the ACM could be relatively advantageous for the soil disturbance issues, when compared with the MCM. This is because the lid of the chamber moves very carefully when creating an enclosure for the measurement. With the MCM, the monthly value is periodic, whereas for the ACM, the average value is calculated based on several low and high values collected over a period of 1 month. In the ACM, the monthly Rs average was over the daily average value and it was collected using the MCM (Fig. 3). These comparisons show that the magnitude of the difference between MCM and ACM depends on their ratio. For example, in Fig. 2a–f, the Rs values obtained in May indicated it was one of the periods in which an overall high value was obtained compared with ACM values of the same period. In contrast, the ACM is divided into low and high values in the first and second halves, respectively, as shown in the change of the RS value in May. The Rs measured using the ACM in May was lowered by approximately 50%, and the monthly average value was also lowered, resulting in a higher difference from the value collected using the MCM (Fig. 3a–f). In addition, the difference between the Rs values of the ACM and MCM could be remarkably reduced by using the MCM for low Rs periods. These differences could lead to large errors in estimating the ecosystem carbon cycle. Figure 4 shows the calculation of the amount of carbon efflux for the measurement period based on the data collected using ACM and MCM. The carbon efflux estimated by Rs measured using the ACM was 7.9 C ton ha−1 compared to 5.1 C ton ha−1 using the MCM, which was 57% higher. In view of these large differences, using the MCM to evaluate Rs and ecosystem carbon flux is very technical and requires extreme care. In this study, we compared the characteristics of ACM and MCM used to evaluate Rs. The Rs values measured using both methods showed a similar tendency with that of the overall seasonal changes. In the ACM, various Rs values were obtained in response to environmental changes, whereas with the MCM, only one Rs value was collected at the time of measurement. In these two methods, the ACM calculates the average from various Rs composed of values. However, since the value of a particular time is representative, errors due to the selection of a measurement time differ from the technical problems associated with the method. In addition, when data are collected at the research site, the ACM minimizes disturbances in measurement (especially, CO2 emissions in the soil) by mechanically stabilizing the operation. However, with the MCM, the instrument is directly operated on the soil at the measuring point, so soil disturbance is highly likely to occur. The intensity of this disturbance could be enhanced if the measurement is not mastered. Therefore, MCM method should be used for Rs data acquisition only after the operator is fully acquainted with the measurement technique and fully understood the necessary precautions. In this study, it cannot be concluded that the ACM is a better method than the MCM. However, the comparison of both methods indicates there is an advantage in collecting the reflected Rs values, but the ACM requires a precise control system, which is expensive and associated with complex technics. In contrast, the MCM is relatively low-cost and the equipment is easier to operate than that of the ACM; however, the simple and biased Rs value is limited in providing accurate results because of the collection procedure. In conclusion, it is necessary to fully understand these advantages and disadvantages and to select appropriate measurement methods according to the research conditions and purpose. The original version of this article was revised: PDF/HTML mismatch. Text was missing in the PDF version of this article. A correction to this article is available online at https://doi.org/10.1186/s41610-018-0100-5. This research was supported by the National Research Foundation of Korea (NRF), funded by the Ministry of Science, ICT and Future Planning (NRF-2016M3C1B6928005). The author conceived the study, collected the data, interpreted the results, and wrote the manuscript. The author read and approved the final manuscript. , corrected publication 2018 Open AccessThis article is distributed under the terms of the Creative Commons Attribution 4.0 International License (http://creativecommons.org/licenses/by/4.0/), which permits unrestricted use, distribution, and reproduction in any medium, provided you give appropriate credit to the original author(s) and the source, provide a link to the Creative Commons license, and indicate if changes were made. The Creative Commons Public Domain Dedication waiver (http://creativecommons.org/publicdomain/zero/1.0/) applies to the data made available in this article, unless otherwise stated.